Alegna Soap® and I have lot of left over pieces of soap. 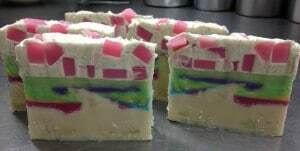 It could be soap from the ends of a log, from a new scent/color combination I want to try out, or from a soap demo or class I taught. Sometimes I use the ends as samples, or I tie them up with pretty ribbon and sell them at an event. 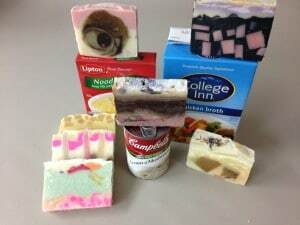 The soap from classes and demos I give to friends. But I’ve been thinking. I have an idea and a great cause. I’ve decided it’s time for a “Soap for Soup” fundraiser. 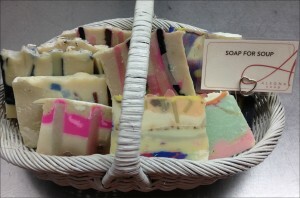 I usually sell my Soap for Soup at $5 for a four ounce bar. I donate that $5 to a local Long Island food pantry. I started Soap for Soup in September of 2015. At the end of December I was able to donate $620 to the St. Vincent de Paul food pantry at St. Martin of Tours parish in Bethpage. This is the organization that helped my friend when she was in need. I want to raise more money. The winter is cold and I know there are many in need. In the month of February while my supply lasts, use the code sfs2016 and get $1.00 off each bar of Soap for Soap. I’ll add in some of my ends, demo or class soap too. Great soap, great cause and great deal. You can’t lose. What a great idea! I love improving lives through SOAP! I love how you integrate business with charity; it’s truly inspiring work! Thank you for taking care of your local community. Thanks Kristen. I believe I have a responsibility to give back. What a great idea! Maybe your local news station could do a feature on this to get the word out. Thanks Donna, that’s a great idea!